The human species has endured countless trials and tribulations to reach the point it has reached. Millions of years ago, man's ancestors struggled to survive a harsh environment, where survival was the main purpose above everything else. Ancestors: The Humankind Odyssey tells the story of humanity's earliest ancestors and their journey to evolve across millions of years. Beyond its unique concept, it also marks the first major release for Assassin's Creed creator Patrice Desilets and his new studio, Panache Digital Games. Shacknews recently had a chance to go hands-on with Ancestors, but along the way, we also took the opportunity to speak with Desilets about this upcoming project. We asked about working with a smaller development team, the ancient African continent, and how much Ancestors' world will open up over the course of a player's time with the game. Shacknews: How would you describe Ancestors? What type of game would you classify it as? Patrice Desilets, Panache Digital Games studio founder: It's an action-adventure, third-person open world survival game. You play as the last common ancestor of all the big apes, starting ten million years ago and you evolve up to two million years ago in Africa. It's all about surviving a harsh environment that wants to kill you, basically. You can play as one character or a full clan. Shacknews: When people hear the name "Patrice Desilets," they'll often think of the Assassin's Creed series or they'll think of your work on the old Prince of Persia: Sands of Time trilogy. How do you sell that audience on what looks to be a very different gaming experience? Desilets: At first, if you like the verticality of the games that I made in the past, you'll find it back. You're climbing trees, climbing rocks, but also having to actually look for the thing you can interact with, because the entire game environment is interactive. The sense of how you control the character is really fluid, it's really consistent. But at the same time, it's different. It's not a rinse and repeat of what I've done in the past. Shacknews: This is a bold endeavor that you've undertaken with a smaller team than you're used to working with. What have been some of the day-to-day differences that you've noticed working with a smaller team compared to working with a large publisher? Desilets: The main thing is the absence of middle management. You have to know that my lead programmer, my technical director, still code. My art directors still do art. Even my project manager is doing some level design. That's the main difference. Everybody is actually working on the game and less working in an office. But we have a good subject matter to attack as a smaller team, also. Roughly put, it's a character in a 3D environment and it's not about the big epic story, it's about you writing some stories with the systems we gave you. Shacknews: Because you don't have that middle management, do you find communication among the team a lot easier? Desilets: You would have to ask them, but yes. Here, it's like it's the cube. When we do a team meeting, we just stand up. You can write on all the walls. I remember when we showed the game last December, my team told me afterwards, even in the trailer, everybody could say, "That's me. I've done this." It's not somebody on the side or one portion, everybody could say to their friends and family, "When you saw this, that was me." They're proud of that. They own it. That's the beauty of it. For sure, it helps communication. Everybody's touching the work of the other one. The communication goes well, in general. Shacknews: How has the team gone about its research? What have you learned about early humans and animals that you've incorporated into the game? Desilets: A lot! First, I myself have spent the first two years of conception and pre-production really trying to understand the subject matter... and then forgetting about it. What I like is to give sensation to people, moreso than emotion. Sensation and emotion are two different things. When I say it's about forgetting about it, it's that after that, I'm not a college teacher or a professor. It's about you figuring it out, not me telling you what it is. What we've learned, a real quick example, let's say we're in Africa and you're an ape and you're going to eat some bananas. Then you realize, ten million years ago, there were no bananas to be found or even in Africa. That is not something that comes from there. So we did some research. Also, it's funny, because in paleoanthropology, in this field right now, they're debating the timeline of when these things happened. One month, they'll discover something and it'll change the timeline. So instead of trying to repeat the timeline of what science is telling us, it's just about putting everything in the playground for you to discover and find. Shacknews: In what ways can different generations of humans change over the centuries? Gameplay-wise, what opens up to the players? Desilets: First thing, eventually you'll be walking on two legs. That changes your perspective entirely of the game world. At the beginning, the camera's closer, you feel like you don't see a lot of what's going on around. The evolution of walking on two legs, it's something I learned started on trees. That's why you walk on two legs when you're on branches in the game. You're already on two legs on trees. 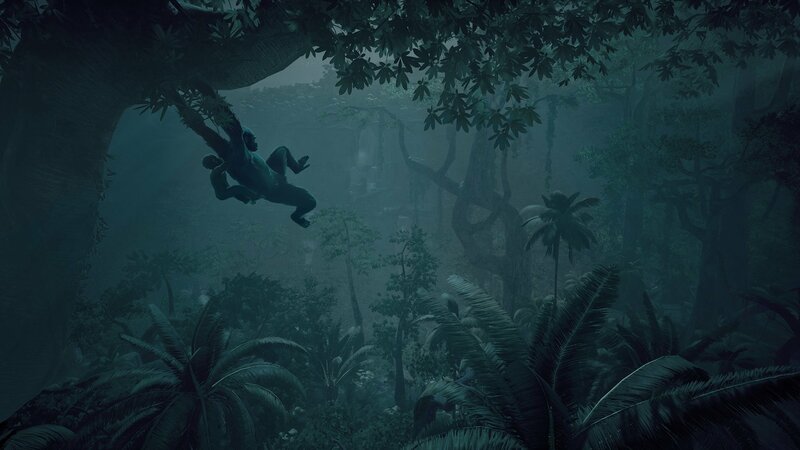 When trees disappeared in that area, the apes who were already able to walk on two legs, they survived, basically. Crafting is something you learn to do. There are better ways of communicating with your clan. You'll eventually be able to eat a lot more food types than you can at the beginning. I don't want to spoil it. It's true! The sheer pleasure of the game is to discover it and understand how it works. Take some time, be aware, we won't give you the answers while you play it. We say it pretty clear, "Good luck! We won't help you much!" Shacknews: How much does the world change as humanity advances? You mention the trees won't be there anymore. How does the world shape itself over the centuries? Desilets: I can't say. You go and discover places to survive, but I'm not spoiling this. Nice try, though! Shacknews: What particular aspect of Ancestors do you feel will truly surprise the average player? Desilets: How big it is. Shacknews: Just how big the African continent is? Desilets: Well, it's not like we modelized the entire continent, but... how big it is. Another part is, once you actually get good at it, it's how beautiful [the world] looks. Once you forget about all the mechanics and you can actually just enjoy the work of really good artists and that, "Oh, this morning, I experienced a morning in the Savannah. And it looks good." Shacknews: I can imagine how much harder it is to make something as big as the African continent. I remember for Assassin's Creed, you'd go out to Israel or Italy. But it's not like for something like this, you could just go out to Africa, because everything has obviously changed in the last ten million years. Desilets: Not only that, when we were in research mode, I didn't have the money to bring my team to Africa. It's easier with bigger studios, "Yes, let's bring a team to Italy for 15 days." But then the other thing, everybody went to a jungle. I went to a jungle in the Caribbean. I spent a month, personally, in Costa Rica. I know it's not the same, but... it's not about trying to re-create it as real. It's more about getting the sensation that you're in the jungle. Because after that, it's a game. It's about limitations. It's about draw distance. It's about memory. It's about the reality of making a game. Shacknews: So were there any other challenges you may not have anticipated with not having a AAA budget? Desilets: It's funny, because it's not like it was pure fun to be in an 800-person team with an unlimited budget. I prefer my difficulties with my smaller team. But it's not like I have to compromise on the ambition somehow. A little bit, but this is why our game is unique. This is why I'm proud of it. Necessity is the mother of invention. This is it. This is the amount. What do we do with it? We create. We work on our lighting differently. Maybe we can have an RPG element, but it's different. We cannot do a full inventory, so let's play with the ends and make something different. What Ancestors is proposing to the player is totally unique. There's nowhere else you can be that ape. I feel like it's the perfect game for Friday nights when it's raining. You'll be in Africa for a while. Desilets: Yes. And we're having fun with it. 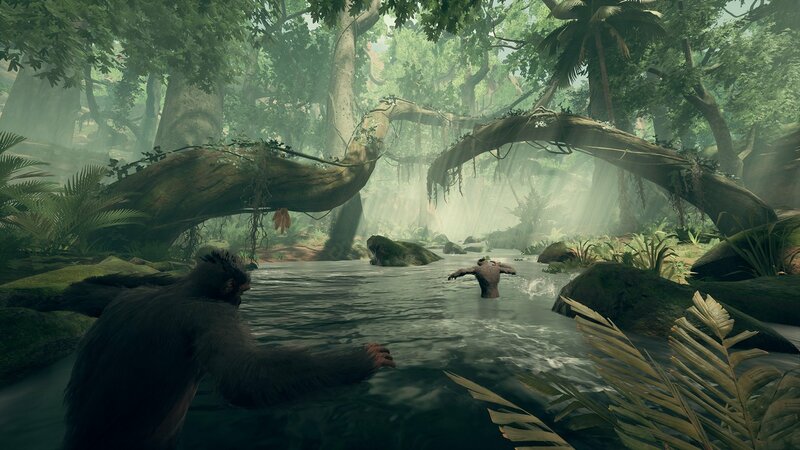 Ancestors: The Humankind Odyssey is coming soon to PC, PlayStation 4, and Xbox One.